Directed by Christian Lamb, the project captures the group live at the Staples Center in their hometown of Los Angeles, CA this past New Year’s Eve. “Motley Crue has always been about passion,” writes Sixx. “We did things our way and ended it honestly ‘Our Way’.The press has obviously seen a screener of our last show The End and is only using the parts of interviews that push drama for them and aren't concerned with the millions of fans and the beauty of our last show together. “You can't wrap up a 35 year career with a couple sounds bites to get attention for your websites and programming. The End is a combination of everybody's hard (ed note: Sixx left a word out here) from production people, crews, managers, agents and the band but the most important aspect is the fans. 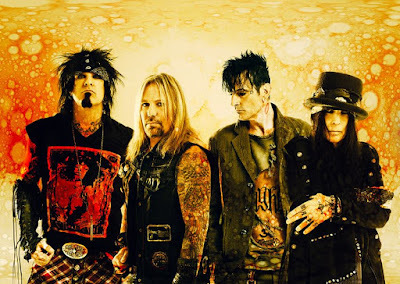 Sixx’s outburst follows comments by drummer Tommy Lee that revealed the “band of brothers” as presented in Motley Crue’s imaging wasn’t accurate, at least in recent years. “Yeah. It's kind of strange, man. We're a weird band,” Lee told Rolling Stone. “Even stranger, after the final night, we had a big party backstage on New Year's Eve, and I never saw the other guys. We never even said ‘goodbye.’ Strange as hell, dude. I think Nikki unfollowed me on Twitter, like, the next day. Ironically, Sixx’s rant about controlling branding and the media follows a feud he initiated on his radio show (ie. a media outlet of its own) with comments slamming Gene Simmons for his remarks over the death of Prince. While Simmons failed to acknowledge his statement, Paul Stanley defended the KISS bassist’s egocentric comments while not actually supporting them himself.